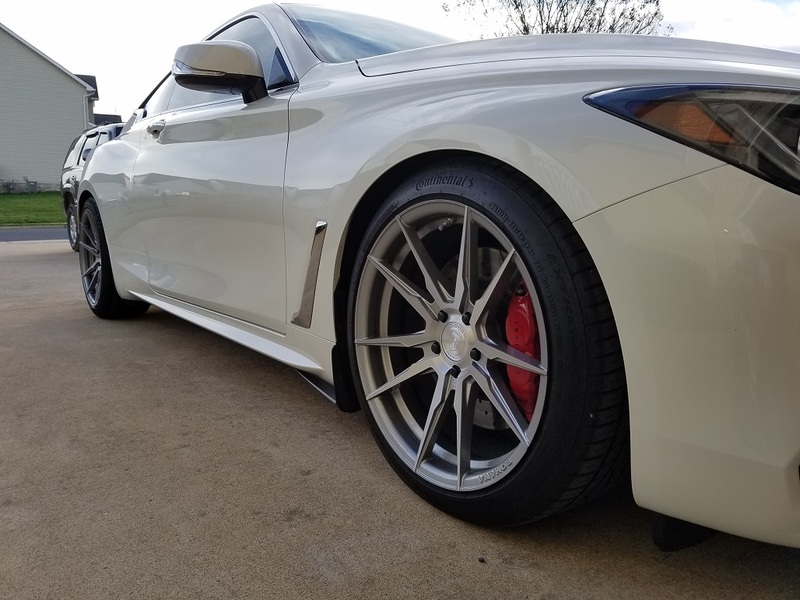 Infiniti Q60 Forum > 2017+ Infiniti Q60 Tech And Performance Section > Brakes And Suspension > RWD Springs on AWD? So this is probably impossible to answer without someone just biting the bullet and trying it out, but does anyone know if springs designed for RWD's would fit on an AWD? My reason for asking is I'm jealous of RWD owners being able to buy progressive springs like the Tanabe's and Eibach's and want to know if anyone has maybe tested out RWD springs on an AWD. Before RSR came out with Q60 specific springs I did play around with RWD Q50 springs on my AWD up front with no problems really aside from the fact that the rear Q50 springs are significantly longer and thus gave my baby a bit of a rake which wasn't bad, but just wasn't the look I was going for. My ultimate goal is to just smooth out the slow bump in the ride a tad bit more which I know is a silly notion but what can I say, I want my cake and want to eat it too! Better yet, can anyone with access to the service manual tell me if there is any real significant difference in the rear suspension between the AWD and the RWD? In theory, the rear springs in a RWD set should be able to fit and work on an AWD. 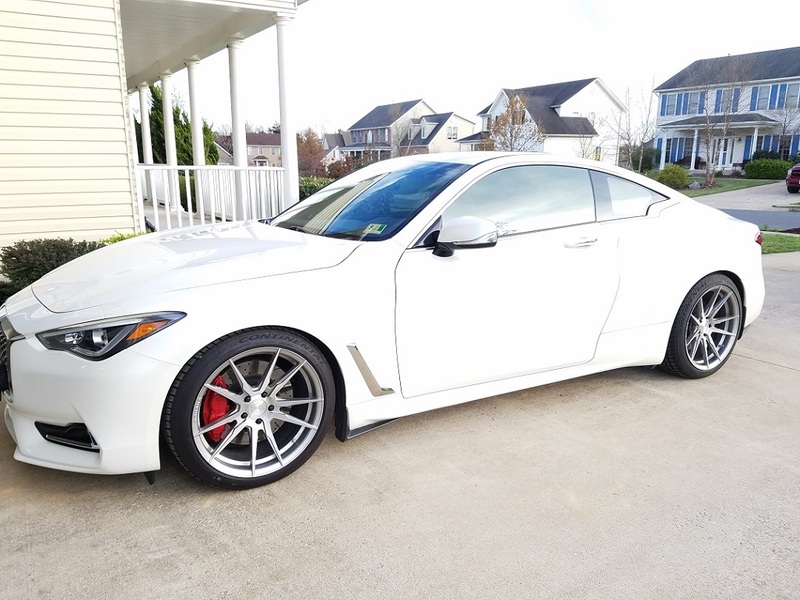 It might seem like a stretch, but I can tell you after riding with RSR Q50 RWD front springs and Q50RS AWD rear springs for experimentation anything is possible. Heck I've used the old 2015 Q50 service manuals for most DIY stuff on Vicki's suspension. Anywho, I'm super impatient so instead of waiting for any responses from yall I went ahead and ordered a set of Tanabe's to experiment with at least with the rear struts. If it ends up being a fail one of yall are gonna need to buy them off me to make my fiance not kill me okay?! JakeFromLI and skid like this. I thought this might interest some folks. Here are the stock heights for 2017 Q60's on P245/40RF19's. These numbers make me really interested in this project. Springs coming in Thursday, looking to install them this weekend. Im waiting on Tein to come out with a AWD coilover but in the meantime, ill be checking out your progress. The only way to know the differences between the AWD and RWD suspension is to cross check the part numbers of struts and springs. 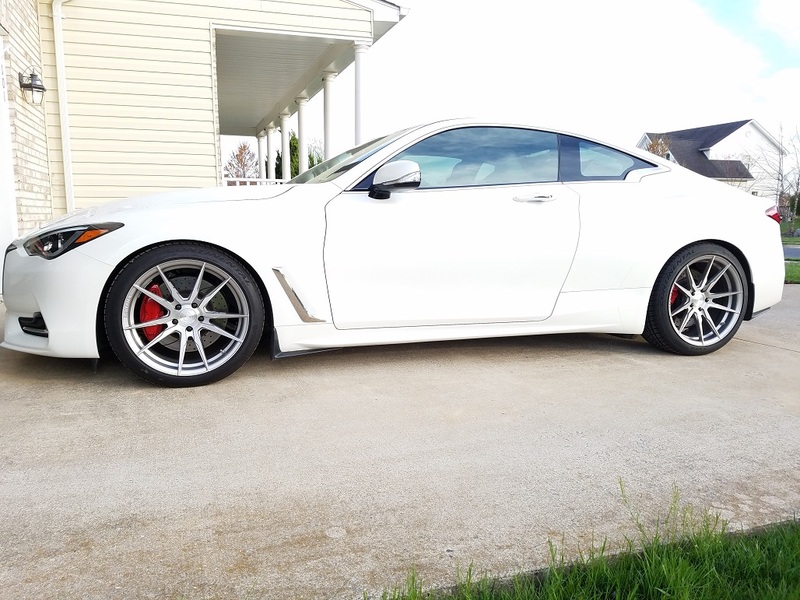 Well Eibach Q60 RWD springs installed in my AWD on all four corners, and I can tell there's a noticeable difference in the nature of the ride. The best way I can describe it is the sharpness of the bump has been significantly dulled. Slow bump feel is certainly less bouncy, much more of a floating feel which is what I was hoping. Drop-wise was the most interesting outcome with just a slight increase in the rear, but oddly enough the fronts seem to stand almost exactly where the RSR AWD springs where which was a surprise. Comparing the Eibach RWD springs side by side to the RSR AWD springs showed very similar length. I'll include pictures in a few days, she's a bit filthy so I'll have to clean her up before taking any pics. I'll also be posting measurements of before and after, I'm just giving the Eibach's a few days of driving my daily route to see if the settle a bit. All in all, I think this experiment can be considered a success for my goal of finding my happy medium between stock and dropped ride. I'll return with pics, stay tuned! well keep us updated. only issue would be spring rates since the weight distribution between the rwd and awd are different. This will effect handling. you cant really compare lengths of springs since a stiffer spring will compress less then a soft spring under load, even if they have the same lengths. Post some pics when you have a chance. I totally agree, spring length does usually tell us any info on a spring working well with a given car's OEM strut. I made that observation only due to how different the Q50 springs some of us tried out back in 2017 were actually quite different in length, especially the rears which ended up giving a raked stance. I also agree that this will effect handling, in fact that's the whole point of this experiment. I'm not tracking this car, so I'm not really concerned with being able to maximize cornering capabilities. My daily route to and from work supplies a decent test field of road conditions and various road abnormalities, and the Eibach's on my AWD have shown to be up to task thus far. Sorry I just can't stand this being uncorrected, I meant "spring length doesn't usually tell us .... "
Alright here are some pictures with the Eibach springs installed and driven about 400 miles. Front Height measures = 26.5"
Rear Height measures = 26.75"
Rear Height measures = 26.9"
All in all not a bad look at all. Ride-wise I think it's a bit of an improvement in the rear's feel, I'm still deciding about the front. Keep in mind I'm speaking of improvement in terms of a DD. Sorry for the weird contrast on the first two pics, I wanted the wheelwells to show better.